I don’t usually write about Younger Son and I rarely trumpet my kids’ accomplishments online. For one, because they don’t want me to talk about it. And two, because I find it a wee bit unseemly to brag about my kids. But last night my son did something so amazing I just have to say it. 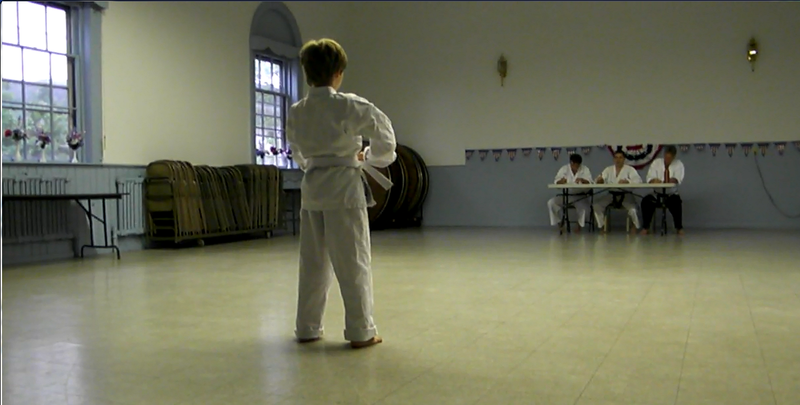 My quiet boy, the one who holds it in and buries it until it explodes (like his mother), who has struggled to find his place, stood alone in front of ten people and took his yellow belt test. In Korean. With a man he doesn’t usually train with, so the pronunciations were different, and he was asked to do several things over. We’ve never done this before and had no idea what to expect. His father and I sat anxiously on the sideline, watching closely for signs of a breakdown. And what would we do if he had? Would it be worse to sit back and let it happen, or rush in and hug him? The whole point of the class was to give him more confidence. The way he faced this challenge was inspiring. He’d been nervous all day and I kept telling him his teacher would not have arranged the test if he didn’t have faith that Younger could pass. We used all the tricks we’ve learned to keep calm – deep breaths, repeating the words “I can do this. I know what I’m doing,” over in his mind when he got upset. As his instructor told us, it will just be doing everything you already know and do in class. I looked at my little one, so tiny in the middle of the big room, and was scared for him. It was silent except for the tester’s commands, and all eyes were on him. He went through his moves with strength and determination. Occasionally he made a slight bobble but always recovered. When it was time to get his new belt his teacher asked for a family member to come and take his old one. Older Son jumped up and ran to his brother. Younger got his new belt, a certificate, bows and praise and claps, and it was over. When we got home, Dave told him there was no way he could’ve done what Younger did when he was that age. I just hugged and hugged him. He wrapped an arm around my neck and held me tight, tighter than he has in a long time. It surprised me, and I think he really needed to hold onto something until all the energy of the experience had left his body. I held tight back, for as long as he would let me. Just when we are most worried about our children they can really surprise us. I am prouder of my son than I have ever been for any of his accomplishments. He had more in him than I ever knew. And today I am overwhelmingly grateful for that. This entry was posted in Motherhood and tagged apron strings, boys development, stress by Amy Pybus. Bookmark the permalink. Awesome!!!! I am so happy for you and him!!! Thanks Tim, it was totally awesome. He’ll show you it next time you come over! What a beautiful occasion for you all. Congratulations! Thanks lazy hippie mama and now I’m going to check out your awesome looking blog too! OK, OK, Lady… your three most recent blogs have “had-me-at-Hello”, but I’m sitting here bawling over this one! What an amazing family. So proud to know you all. Younger,Older and their parents are inspirational, if you ask me. Thanks for sharing so much of yourselves.